My favorite Beatle has always been George Harrison. Except for maybe Marge Simpson, Ringo is few people’s favorite, Paul is silly and egomaniacal, and John comes a close second, except that he lets Yoko sing on records. To me, George had everything. Listening to Abbey Road as a child, I was always more fascinated with “Here Comes the Sun,” and “Something” than with most of the other songs on the album. There was something calm, relaxing and centered about Harrison, as if he had everything together. In 1970, the biggest band in the world broke up, and each member was left to go their separate way. I have two favorite stories about George Harrison. Both brought me to tears. The first involves the recent clamor over the Concert for George albums and video. PBS basically centered their pledge weeks on the film, playing it ad infinitum, all the while fans never tiring of its majesty. For weeks on end at that time, I had customers coming in for both the CD and DVD until I felt like opening up a separate Concert for George outlet store. The tribute itself was moving and masterful, featuring guest appearances by ringleader and best friend Eric Clapton, guru sitar player Ravi Shankar, fellow Wilburys Tom Petty and Jeff Lynne, and his old bandmates, Paul McCartney and Ringo Starr. The player on stage that I was most captivated by, however, was not one of these rock icons. Instead, it was a youngster who made me do a double take at the screen, thinking that somehow George had been reincarnated into a younger self to pay loving tribute to himself. That youngster turned out to be Dhani Harrison, George’s son, who, at 25, is and was the spitting image of his father. The love felt for Harrison’s music and spirit were palpable, even through a television screen and stereo speakers. It is no coincidence that most of the songs in the concert, specifically the closers, were taken from All Things Must Pass. My other favorite story involves Bob Dylan. I was listening to an NPR story on Mr. Zimmerman since there was a large exhibit on the folk rocker at Seattle’s Experience Music Project. The radio show covered Dylan’s early years, up until 1966′s Blonde on Blonde. They ended the show with a cut from the 1993 30th Anniversary Concert at Madison Square Garden. The song was “My Back Pages,” originally from the album, Another Side of Bob Dylan. Much like The Concert for George, even including some of the same guests, various luminaries took turns singing verses from the song, all chiming in with the chorus of “Ah, but I was so much older then, I’m younger than that now.” Tom Petty, Neil Young and Eric Clapton took turns on the first verses with Dylan finally making an appearance towards the end. As he was the guest of honor, in celebration of 30 years of his recorded music, I thought his verse would be the last. I was wrong. Dylan gave the last verse to George Harrison. I couldn’t help but choke up. I realize I still haven’t really talked about the mega album that was All Things Must Pass, so I suppose I should. Most of the songs are ones that Harrison was not able to squeeze onto a Beatles album thanks to the stifling presence of the dual songwriting team of Lennon and McCartney. So what do you do when you can’t get a song on your own band’s album? You release three records’ worth. What’s more surprising than the quantity of songs is the quality. “My Sweet Lord,” despite the plagiarism tag, is a moving spiritual paean to God, whichever God he may be. “I’d Have You Anytime,” “Isn’t It a Pity,” “If Not For You,” “Let it Down,” “Beware of Darkness,” and the title track are all worthy songs, proving that Harrison had a lot more in him than at first Beatles’ fans might have thought. To me, the one brilliant piece on the album is “Wah-Wah.” The song’s meaning has been attributed to kicking drugs, the sound of a guitar (and in turn, a specific pedal), and the Beatles (or one specific one). Due to the cryptic nature of the title and lyrics, it could be all three. Like all pieces of art, its true meaning now lies in the ears of every listener and what they prefer it to be. I go back and forth, but I’ve always had an inkling that it was really about the Beatles / Paul. Maybe that’s why he looked somewhat uncomfortable at the Concert for George. There’s far too much music on All Things Must Pass to cover in one review, so I’m not going to try. What more can you say about a still underrated guitar legend that has always been overshadowed by his bandmates? 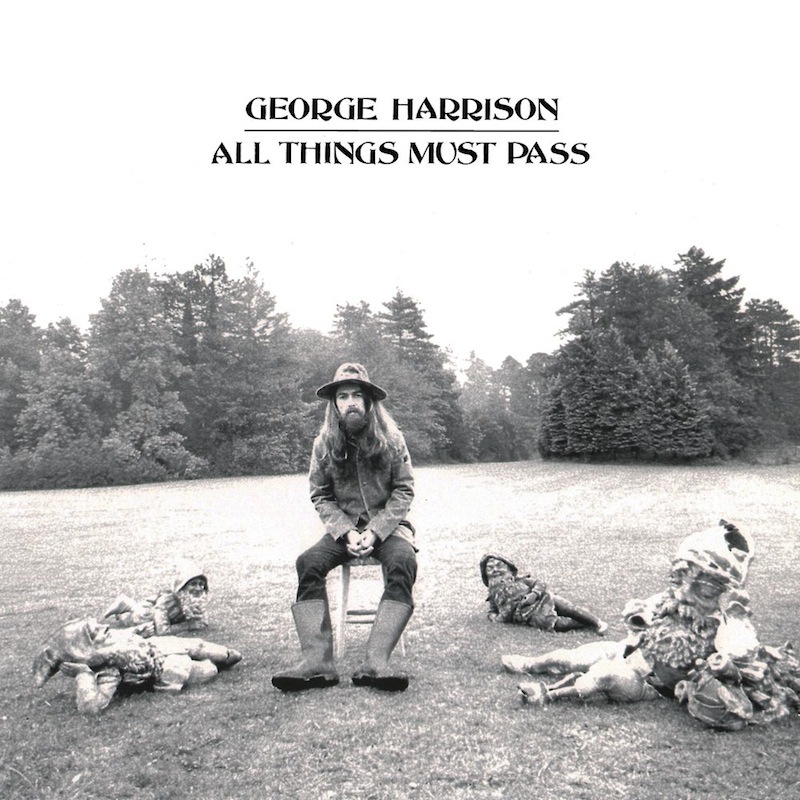 I can say this: George Harrison is an amazingly talented songwriter / guitarist / spiritual being, and All Things Must Pass is one of those albums that come along once in a lifetime. Near every song is a timeless piece of art, holding up just as well today as it did then. Usually when one listens to songs of the 70′s, there is a sense of the distant past, bad clothes, hair and styles. I’ve heard “My Sweet Lord” and “Wah-Wah” on radios in shops and delis at various times and always felt that the songs were timeless. I can listen to Harrison’s twanging lead guitar and mellow voice no matter what mood I’m in, and somehow he makes it all seem brighter.